If you're using dried yeast, whisk it with 1 tsp of the sugar and 575ml lukewarm water. Set aside for 15 minutes until the mix begins to froth. Put the flours into a bowl and mix in the salt and remaining sugar. Add the lard or vegetable fat and rub in until completely incorporated. Make a well in the centre of the flour. If using fresh yeast, crumble it into 575ml lukewarm water. Pour the yeast water (dried or fresh) into the flour. Mix, first with a spoon, then with your hand, until the sides of the bowl are clean. Turn out on to a floured board and knead for 10 minutes or until smooth and elastic. Put in a clean bowl, cover and leave in a draught-free place for 30-45 minutes or until doubled in size. Meanwhile, preheat the oven to 220°C/gas 7 and grease and line two 1kg loaf tins. If you want to make rolls, grease a baking sheet. Knead the dough again, knocking out the air. 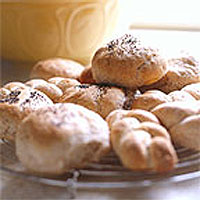 Shape into loaves and put in the tins, or shape into 12 rolls and put on the baking sheet. Set aside in a draught-free place for 10 minutes. Bake the loaves for 20-25 minutes, and the rolls for 15 minutes, or until golden brown. The loaves should slip out of the tins easily with a gentle tap and the bases should sound hollow when tapped. If not, put them back in the tin and cook for 5 minutes more. Cool on a wire rack.